I'm bringing back Top Ten Tuesday! Who's excited? Ok, probably just me. :) In the spirit of the current season, today's Top Ten Tuesday will feature ten of my favorite Christmas movies, along with some fun gifs and memes. Enjoy! 10. The Polar Express - My eldest son loved this movie as a 3-4 year old and my other kids have come to love it too. Our local movie theaters usually show it around Christmastime (with hot chocolate too!) and we've enjoyed going to see it in the past. "Tom Hanks and director Robert Zemeckis ('Forrest Gump'; 'Cast Away') reunite for 'Polar Express,' an inspiring adventure based on the beloved children's book by Chris Van Allsburg. When a doubting young boy takes an extraordinary train ride to the North Pole, he embarks on a journey of self-discovery that shows him that the wonder of life never fades for those who believe." 9. Christmas With the Kranks - This one is newer (well, relatively) to my list. It's funny and sweet. "Finally alone for the holidays, Luther (Tim Allen) and Nora Krank (Jamie Lee Curtis) plan to eschew the Christmas traditions and take a cruise in the Caribbean instead. This doesn't sit well with their Christmas-obsessed neighbors Vic Frohmeyer (Dan Aykroyd) and Walt Scheel (M. Emmet Walsh), who are determined to win the annual "best decorated street" competition, and the Kranks soon find themselves social outcasts because of their lack of Christmas spirit. 8. Rudolph the Red-Nosed Reindeer - A holiday classic for sure. "Sam the snowman tells us the story of a young red-nosed reindeer who, after being ousted from the reindeer games because of his beaming honker, teams up with Hermey, an elf who wants to be a dentist, and Yukon Cornelius, the prospector. They run into the Abominable Snowman and find a whole island of misfit toys. Rudolph vows to see if he can get Santa to help the toys, and he goes back to the North Pole on Christmas Eve. But Santa's sleigh is fogged in. But when Santa looks over Rudolph, he gets a very bright idea..."
via GIPHY 7. Christmas Vacation - There are SOOOOO many gifs I could have chosen for this one. However, I most identify with Ellen so I went with her. I think everyone can relate to it in some way. "As the holidays approach, Clark Griswold (Chevy Chase) wants to have a perfect family Christmas, so he pesters his wife, Ellen (Beverly D'Angelo), and children, as he tries to make sure everything is in line, including the tree and house decorations. However, things go awry quickly. His hick cousin, Eddie (Randy Quaid), and his family show up unplanned and start living in their camper on the Griswold property. Even worse, Clark's employers renege on the holiday bonus he needs." 6. Elf - LOVE this movie. The description doesn't do it justice. I believe we went to see it in the movie theater and my still text each other quotes. :) "Buddy (Will Ferrell) was accidentally transported to the North Pole as a toddler and raised to adulthood among Santa's elves. Unable to shake the feeling that he doesn't fit in, the adult Buddy travels to New York, in full elf uniform, in search of his real father. As it happens, this is Walter Hobbs (James Caan), a cynical businessman. After a DNA test proves this, Walter reluctantly attempts to start a relationship with the childlike Buddy with increasingly chaotic results." 5. Dr. Seuss' How the Grinch Stole Christmas - Although I love the original cartoon Grinch movie as well, the live-action adaptation was wonderfully done. This is another one that my aunt, cousins, and I memorized. "In this live-action adaptation of the beloved children's tale by Dr. Seuss, the reclusive green Grinch (Jim Carrey) decides to ruin Christmas for the cheery citizens of Whoville. Reluctantly joined by his hapless dog, Max, the Grinch comes down from his mountaintop home and sneaks into town to swipe everything holiday-related from the Whos. However, the bitter grump finds a hitch in his plans when he encounters the endearing Cindy Lou Who (Taylor Momsen)." 4. 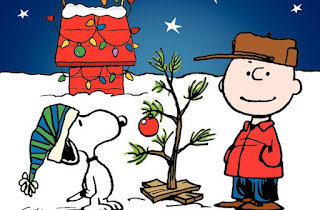 Charlie Brown Christmas - Another tried and true holiday classic. "Christmastime is here. Happiness and cheer. And for Peanuts fans everywhere, it just wouldn't be Christmas without this classic holiday delight. Christmas lights may be twinkling red and green, but Charlie Brown has the Yuletide blues. To get in the holiday spirit, he takes Lucy's advice and directs the Christmas play. And what's a Christmas play without a Christmas tree? But everyone makes fun of the short, spindly nevergreen Charlie Brown brings back - until the real meaning of Christmas works its magic once again." 3. 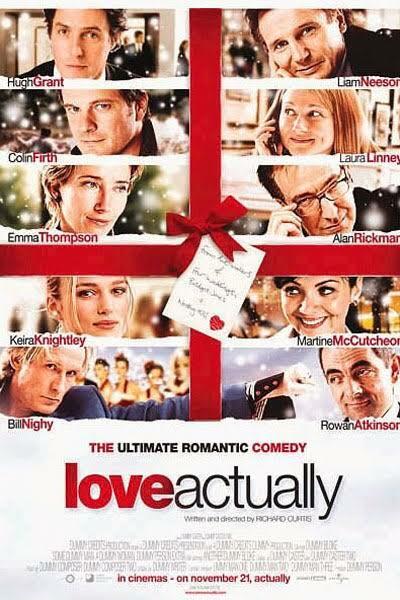 Love Actually - I've heard some people say they think this movie is cheesy but I adore it. It's a unique look at life & love and has a fantastically stellar cast. "Nine intertwined stories examine the complexities of the one emotion that connects us all: love. 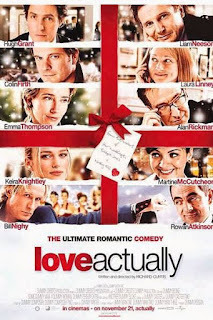 Among the characters explored are David (Hugh Grant), the handsome newly elected British prime minister who falls for a young junior staffer (Martine McCutcheon), Sarah (Laura Linney), a graphic designer whose devotion to her mentally ill brother complicates her love life, and Harry (Alan Rickman), a married man tempted by his attractive new secretary." 2. A Christmas Story - I think A Christmas Story has moved up further in the ranks as I've aged, probably because I identify with the mother. "Based on the humorous writings of author Jean Shepherd, this beloved holiday movie follows the wintry exploits of youngster Ralphie Parker (Peter Billingsley), who spends most of his time dodging a bully (Zack Ward) and dreaming of his ideal Christmas gift, a 'Red Ryder air rifle.' Frequently at odds with his cranky dad (Darren McGavin) but comforted by his doting mother (Melinda Dillon), Ralphie struggles to make it to Christmas Day with his glasses and his hopes intact." 1. It's A Wonderful Life - Say what you will, but It's A Wonderful Life will always be my absolute favorite Christmas movie. I love the story and it never fails to make me weepy. "After George Bailey (James Stewart) wishes he had never been born, an angel (Henry Travers) is sent to earth to make George's wish come true. George starts to realize how many lives he has changed and impacted, and how they would be different if he was never there." via GIPHY Did I miss any? Let me know what your favorite Christmas movies are in the comments!